How would like to get caught by the #Cuparazzi, get discovered and then win a VIP Red Carpet Premiere trip for two? What am I talking about you ask? I’m talking about a really fun contest from Chinet! I receive a lot of emails about contests and asked if I would share them with my readers, but this one stood out to me because my entire family (from my 10 year old to us adults) are huge fans of these Chinet Comfort Cups. So I knew I had to share both the contest with you and about the cups. I purchased these cups on a whim with a coupon and we’ve decided we can’t live without them ever since. We do own a few travel mugs, but our travel mug collection went from about 10 to 5. How? Who knows! They were lost, broken, accidentally washed in the dishwasher – you name it. And those things are not cheap! Since we are on the go quite a bit and our teens are responsible for purchasing their own extras (like expensive coffee from you know where), we make our own coffee from home and bring it with us. 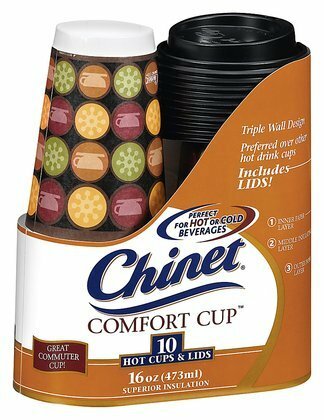 This is where the Chinet Comfort Cups come in handy and we just love them. They’re stylish, functional, they keep our drinks hot for long periods of time and the price is right. Entering the contest is simple and fun. Just enter a photo of you and a Chinet Comfort Cup to one of your social media profiles using the tag #Cuparazzi. After you enter, you’ll receive a message back leading you to a short form to enter. Easy peasy! You can already see quite a few of the entries here. Join the Chinet club and get a $1 off coupon here. Good luck on the contest! !